Mrs. Travis' 4th grade science students began by doing research on the internet in the computer lab. 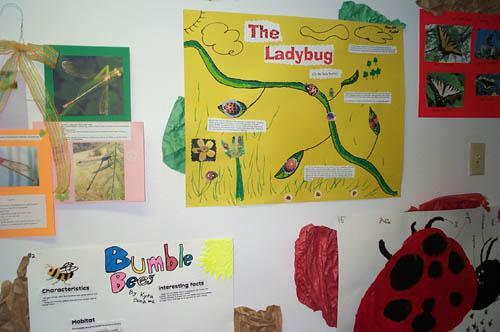 One good program is Let's Talk About Insects. Another good resource is an Insect Webquest. Their next step was to pick an insect to research. They were to find the information they needed on the internet, then they were to make a visual aid. It could be a poster, a sculpture, a diorama, or any other media they wanted to use. They had two and a half to three weeks to prepare. They could handwrite their report or do it on the computer. Each report was presented orally to their classmates. 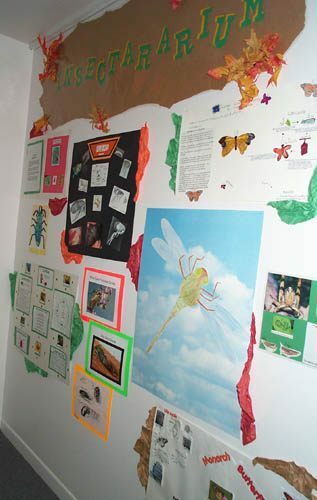 Their posters are presented in a hall display. Press "Go" to search for Insects.